Si Robertson has gone from chief duck call maker to beloved star of A&E’s Duck Dynasty. Through his transition, he has remained untainted by the popularity and money, and is the same man he was before stardom—generous, kind, compassionate, and a little bit crazy. Beginning where Si-cology 1 ended, Uncle Si gets much more personal as he talks about his life on the road as one of the show’s favorites, and how he feels about life after the show. 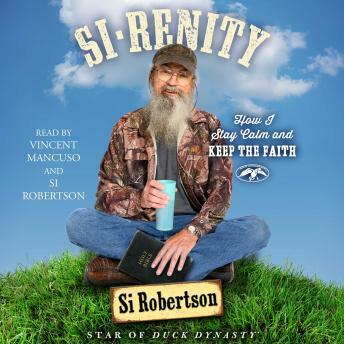 Si-renity will be full of Si-style, hilarious stories, as well as an up-close look inside the heart and faith of this loveable fan favorite. Cast members from the show reveal the kindness and compassion Si has for children, the military, and the less fortunate. Full of zany, yet honest stories about his day-to-day life on the road, Si narrates the lessons he’s learned about living life courageously and joyfully, and shares his personal source of peace and love for others—both originating directly from his faith in God. The scriptures he was great. The names of each chapter was sometimes funny. It had lot of detail on his life and beliefs. It also great to know how God got him through some life’s trials.